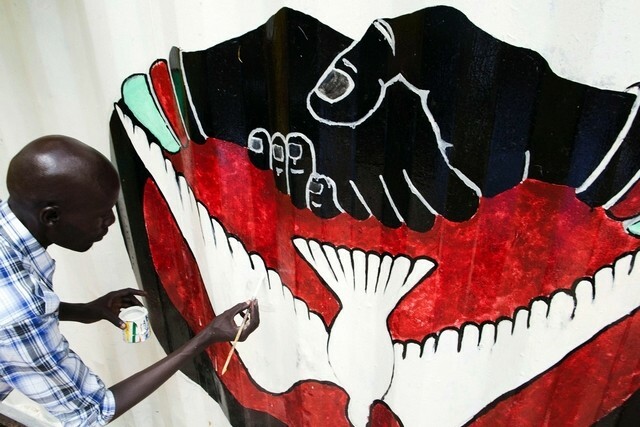 JUBA // On bakery walls, buildings and roadside sheeting in South Sudan’s capital of Juba, street artists fed up with war are painting for peace as young musicians, actors and artists campaign to end decades of conflict. A mural of a child in a singlet working at a sewing machine reads “the young who are tired are the ones who will sew the fabric of our nation back together”. A white-washed bakery wall features stark silhouettes wielding axes while a container doubling up as a cultural centre shows an AK-47 shooting doves instead of bullets. The anti-war street art burgeoning on the roads of the hot, humid South Sudanese capital on the banks of the White Nile, the scene of heavy combat as recently as July, is the work of a newly-created movement called #AnaTaban. #AnaTaban tags itself on twitter as “a community of young South Sudanese creatives who are tired of seeing our people suffer”. The world’s newest nation won its independence only five years ago after decades of war. But the fighting continued, degenerating into a particularly brutal civil conflict that has driven more than one million people out of the country and displaced many more. Villages have been burnt to the ground, almost half the population relies on food assistance to survive and women and girls are raped by government and rebel forces, according to rights groups. With no end in sight, some 40 entertainers and artists in Juba set up #AnaTaban with the support of exiled compatriots also involved in the arts. They hope to spread to other cities such as Wau, Yei, Aweil and Yambio. “What #AnaTaban is doing is actually to create a platform for other young South Sudanese people to raise their voices, to speak out their mind, so we all have everlasting peace in this country,” said co-founder Joyce Maker. Maker, an actress, plays out dire scenes of the conflict through theatre, while #AnaTaban musicians have recorded a first song and are preparing another under the theme #AnaMalesh – “I’m sorry” in Arabic. Over the coming weeks the group plans a series of public events, on streets, in hospitals, schools and even in prisons. “What is happening now in South Sudan is corruption, war, conflict,” said painter and cartoonist Thomas Dai. Last week, a report commissioned by actor-activist George Clooney alleged massive corruption and war profiteering by its leaders, saying the key factor in the fighting was “competition for the grand prize – control over state assets and the country’s abundant natural resources”, notably its oil. Poet and rapper Asif Kafi described the group’s work as “art-ivism”, combining art and activism. “We have musicians, we have artists, people … portraying a message of peace and reconciliation,” he said.